The following information is provided by Gabe Howe, Executive Director of the Siskiyou Mountain Club. Along the way, encounter historic sites including the cabin of western author Zane Grey, and the Rogue River Ranch, a historic mining outpost that is a registered National Historic Site and museum. The Wild Rogue canyon is famous for its roaring rapids, abundant wildlife, and world class salmon and steelhead runs. Start from Graves Creek boat landing, about a half hour from Grants Pass, Oregon. From there hike the trail downriver, and have your pick at the multiple campsites along the way, including a large beach at Whiskey Creek just about 3.5 miles from Graves Creek. If you find the river beaches crowded, opt for camping at one of the many side creeks closer to the trail. One backpacker’s site that stands out is at Kelsey Creek, 15 miles from Graves Creek. It’s remote, pristine, and tucked into a breathtaking old growth forest. 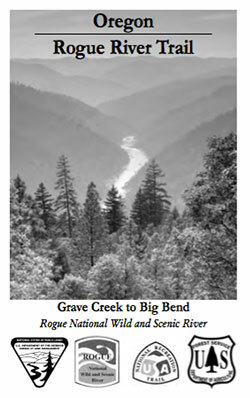 At about 23 miles from Graves Creek, reach the Rogue River Ranch, a national historic site with road access and camping available at the nearby Tucker Flat Campground, which also serves as a trailhead for the Wild Rogue Loop and provides access to premier swimming in the deep pristine gorges of Mule Creek. From Tucker Flat, walk the road downstream for about another mile before its terminus and a trailhead. The Forest Service section of the trail below here enters the Wild Rogue federal wilderness area and is more primitive than the Bureau of Land Management’s upper, non-wilderness section. The next couple miles of the Rogue River Trail traverse along the sheer cliffs that fall into Mule Creek Canyon, and for many this is the most inspiring section of the backpack. It’s also an easy day hike for car campers who drive into Marial. Reach Blossom Bar, another outstanding campsite with easy river access, another world class side creek, and a high line to tie your bear bag from. Between Blossom Bar and Foster Bar you’ll walk by Paradise and Clay Hill lodges, as well as Brushy Bar Guard Station. Notable side creeks include the waterslide up Tate Creek, Flora Dell and Clay Hill Creek. You can extend the Rogue River Trail on parts or all of the Wild Rogue Loop.